It’s no secret that there are some cruel, cruel people in the world. It’s easy to lose faith when seeing animals or humans mistreated on a daily basis. However, there are also wonderful moments that manage to restore faith. This one instance in particular sheds a little bit of light on the good in the world. 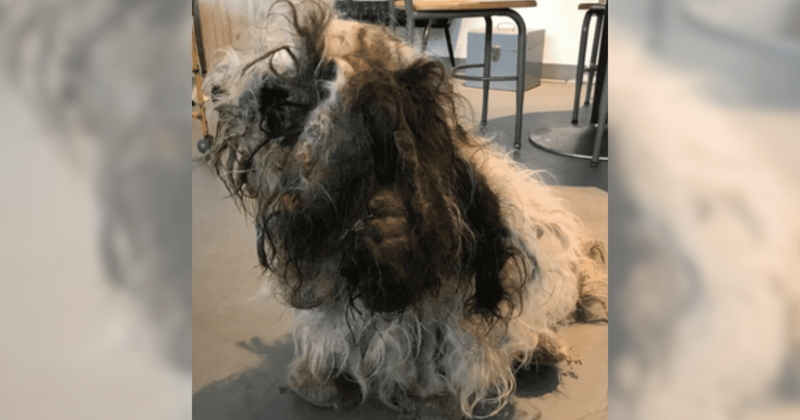 According to Fox 13 News, a dog rescued by the Trio Animal Foundation in Chicago, IL underwent a massive transformation. The small cocker spaniel mix who goes by the name of Sang Su was found on October 4th with his fur matted with urine. And as if that’s not enough, his ears were infected, sore, and beginning to form hematomas. “His eyes look vacant and he has yet to show happiness,” the foundation shared, also stating that he just wanted to be held. He was found looking like this. 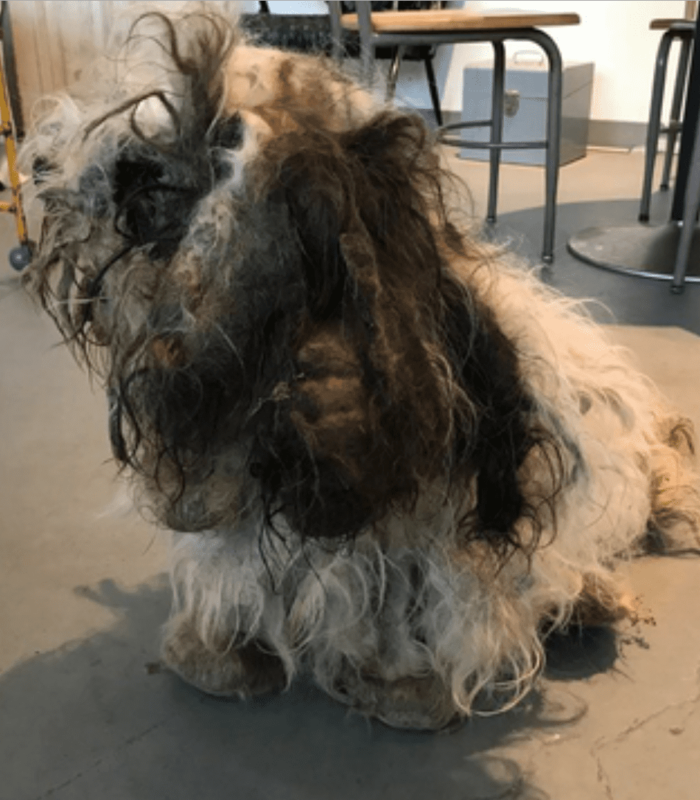 “One can only imagine what this poor dog has been through and the loss that he has endured,” the foundation shared. On October 5th, the foundation shared an adorable video of Sang Su being pet by one of their carers. While he appears to be nervous and shaky due to his traumatic past, he is also clearly enjoying the newfound love and attention. Trembling and unsure of what is going on, the need to be loved far outweighs his memories of abuse. Sang Su’s eyes tell a story of past horrors but his willingness to trust shows that it is not too late to make a difference in his life. Slowly but surely we will get there. It is heartbreaking to see an animal be so neglected, but it is reassuring to see foundations dedicated to righting these wrongs. In the video above, we can already see that this cute little puppy getting back on his feet — or should we say paws! In addition to the disheartening before photo, the group also shared an after photo, and it is downright adorable. Apparently, it took four medical staff members, anesthesia, and at least two hours just to get through the fur. 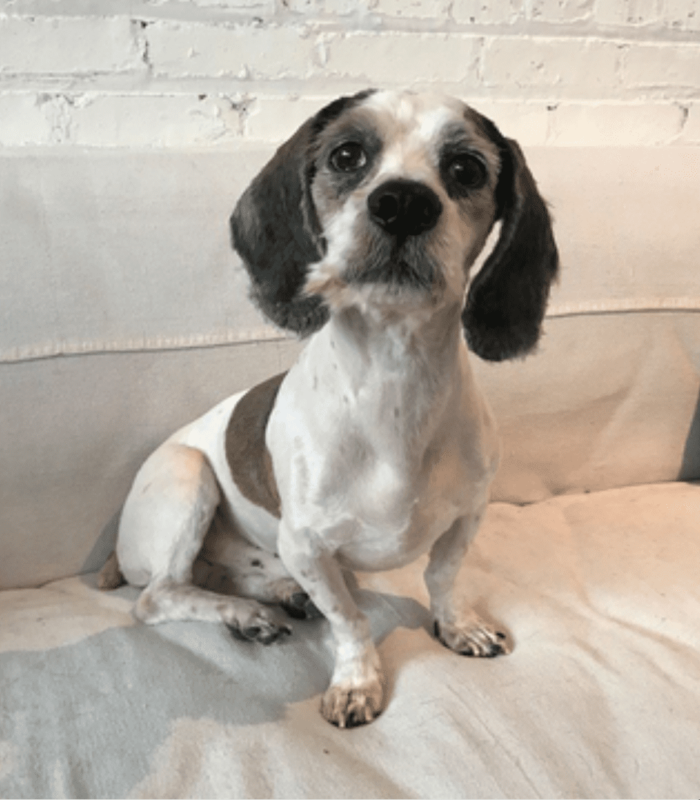 The rescue group shared that he seemed “very unsure” when they took him in and that it was hard to see the dog’s eyes and face when they took custody of him from an Animal Welfare League intake facility in late-September. This transformation is absolutely major. The 26-pound dog is unrecognizable. Finally, we can see the beautiful pup’s face! See the video of him post-haircut, walking around below. While Sang Su looks to be in good health, the sores on his ears will still need some time to recover. Because of this, he is required to wear wraps to protect them. He also has inflammation and skin and eye infections because of the overgrown fur. Like most rescue animals, he will also have some psychological barriers to overcome. On the bright side, it’s only uphill from here for Sang Su. He is beginning to eat again and even made friends with the foundation’s therapy dog, Hazel Grace, plus another dog, Eeyore, who have both been keeping him company. “Sang Su’s eyes tell a story of past horrors but his willingness to trust shows that it is not too late to make a difference in his life. Slowly but surely we will get there,” Trio Animal Foundation shared. The after photos and videos are telling, and we wish Sang Su the speediest of recoveries! Look at the beautiful big boy we found under all of that matted fur! Sang Su is actually a Cocker Spaniel mix with a little nubbin for a tail and long ears… holy cow!It took anesthesia, 4 medical staff and two hours to get through all it Sang Su’s urine soaked fur.His ears are a mess right now as they are infected, have sores and are starting to form hematomas from shaking his head. Hence, the wrapping around his face to keep his ears from moving. Sang Su has a secondary skin infection, infected eyes and major inflammation in the areas that his fur was pulling so tightly next to his skin.Sang Su was still a bit groggy when we picked him up and now is resting comfortably. He finally started to eat and all he wants to do is be held.We will make sure to post an album tomorrow! Thank you to the caring staff at Wicker Park Veterinary Clinic for taking such amazing care of our boy today!